I have built this in 2 days. ( idea 💭to launch 🚀) What's your thought on it?On Monday, I showed article "Reducing Slack's memory footprint" in my twitter feed. It had well explained how they think about the problems and solve them. On Tuesday, I started to look for more engineering blogs from different companies. It would be good to see recommendations of the best products to use. Independent tests and reviews would be great. Zara Crowther has used this product for one day. This was the fastest product I have ever shipped. It was built and ship in 2 days. 🚀🚀 On Monday, I showed article "Reducing Slack’s memory footprint" in my twitter feed. (tweeted by @mathowie) It was written by Slack Engineering team to explain how they solved the problem of high memory consumption of Slack’s desktop app. It had a great explanation about how to approach the problem, think about the better solution and build the desktop application. 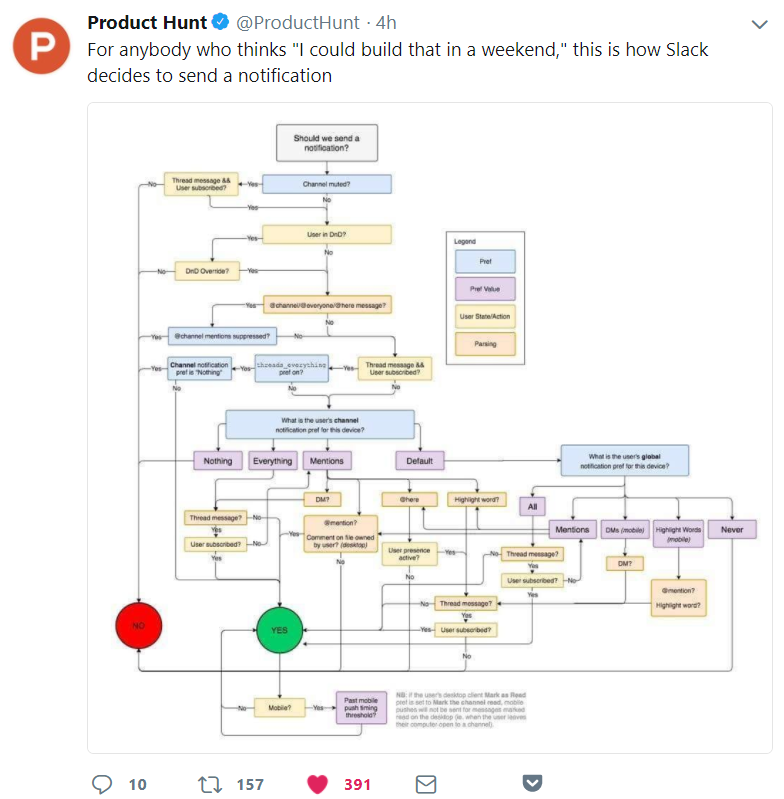 I explored the Slack Engineering blog and it has lots of wisdom shared by the engineering team at Slack. As a software engineer, I am always curious 💭to learn about development strategies behind the great tech products. On Tuesday, I started to look for more engineering blogs from different startups and tech companies. In few hours, I found out that many of tech companies have a special section or blog related to engineering and development. On these blogs, they publish lots of new things including their approach to solve the problem, their experience with different tools and technologies, story about their engineers and more. 👨‍💻 Finally, I decided to build a place where anyone can find all the engineering blogs. 📚 I started working on the idea on Tuesday. By the end of Wednesday, I have built the first prototype. On Thursday, I added new features including 'submit new company blog' and 'the total users' each of these tech company manages to give more sense about how to build and scale infrastructure that handles the traffic of millions of people (Some are in billions.) I posted on few communities and the response was amazing. Thank you @JonathanZWhite for review it. A few hours ago, PH has also tweeted a funny thing on complex engineering infrastructure. Let me know your feedback or suggestions to make it better. @panispieri thank you for suggestion. Combine rss feed of all these blogs will be the next feature I have thought of. It would be great to read new updated from all of them at one place. Would share your blog link here? @keyul what did you make it in? @joshdance using java spring framework & material css framework. @keyul nice one) I have similar one with couple more features, created 4 months ago on Umbraco. http://engineersblogs.gear.host/ . It's finished project but I don't have much time to populate with new blogs. Awesome idea! 👍 I noticed that logos are stretched, and it might ruin the first impression and trust to this resource. @maxsnitser Thanks for informing. What's your monitor screen size? Great collection of blogs. I think it is a must read for all the engineers and data scientists. I particularly liked the Airbnb one. @skipiit glad to know it is useful to you. That's a great idea, I usually love this blogs and often read them, but always as I stumble upon them (I don't rss them or anything). It's a bit unclear what am I subscribing to here - are you going to send a curated list of the best articles? Is it -all- articles written? How often do I get an email? Every time an article is written? I think doing some curation might be good (only share the best, or most popular posts) but might be tricky to do I guess, since most posts of those companies will be high quality. something to get inspiration maybe: http://highscalability.com/ which offers a mix of curation of high quality, but also just high volume, less curated, for people who want to read more. @jauny I like your idea to put best of articles link with into the newsletter. The initial plan of the email list is to send updates about new engineering blogs added on Engineering Blog. As you said providing high-quality posts will also help the subscribers.